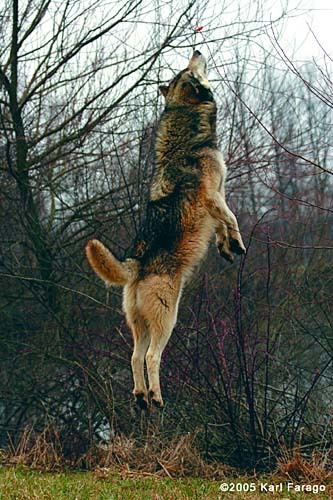 Did you know wolves could jump like this? In fact, they are extraordinary acrobats, capable of hurdling over 7-foot-high obstacles with ease, which is handy when leaping from one ice floe to the next or getting over downed trees in the forest. Some wolves may employ jumping techniques when trying to see over tall grass. Here, this gray wolf is after a bit of food in the tree.